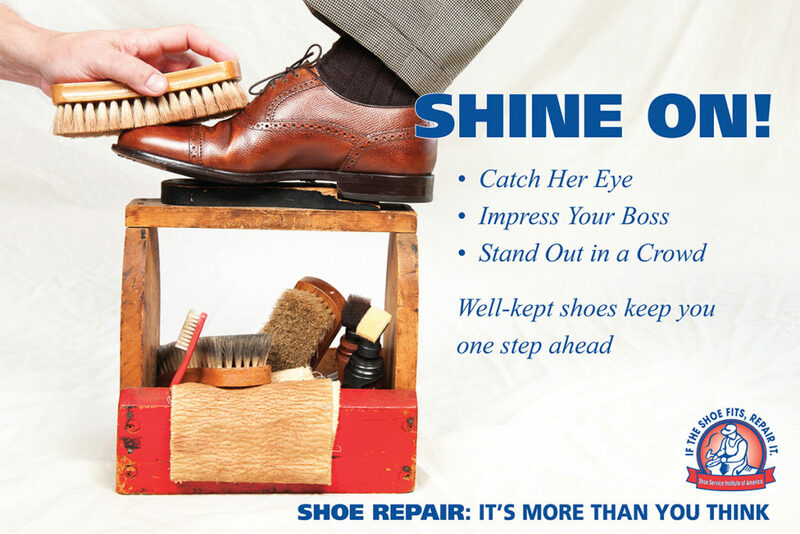 Investing a few minutes each month in shoe care is the best thing you can do to protect your footwear investment. Combined with regular visits to your local shoe repair shop, shoe care will significantly extend the life of your favorite shoes. Many people think shoe care means polish shoes occasionally. Actually, it is slightly more involved than that. Caring for your shoes is a four-step process — cleaning, conditioning, polishing and weatherproofing. The first step in shoe care is to clean the surface with a leather cleaner to remove surface dirt, just as you would wash a car before you wax it. After cleaning, you should condition the leather. Conditioners soften and lubricate leather, keeping it feeling and looking new. Once the shoes have been cleaned and conditioned, then it is time for polish. Polishes contain dyes and pigments to renew color and cover scuffs; waxes to provide shine and protection; and conditioning agents to moisten and renew the leather. There are basically three types of polish — liquid, cream and past. Liquids are easiest to apply, followed by cream and paste. Ease of application, however, is inversely proportional to wax content and the staying power of the polish. Pastes hold up the longest. Creams are easier to apply than paste, hold up longer than liquids and come in a variety of fashionable colors. The final shoe care step is weatherproofing. Though polishes provide some sealing qualities, if you live or work in a wet, muddy or oily environment, the added protection of a weatherproofer is a must. The key to keeping suede and nubuck in top shape is preventative maintenance. Before you wear the shoes, protect them with a water and stain repellent designed specifically for suede and nubuck. As soon as you notice that water is no longer beading up, spray them again. Use a plastic or rubber-tipped brush regularly to restore the nap and remove surface dirt before it sets in. Be gentle brushing nubuck. It is softer than suede and is easily damaged. With oiled nubuck, you need to use a nubuck conditioner to put back some of those oils on a regular basis. If you get a stain on suede or nubuck, try to remove it immediately with a solvent-based cleaner made specifically for the material. Oil absorbing blocks are also available. These blocks abrade the leather to bring back the nap and remove stains. Use a less aggressive block with nubuck because of its more delicate nature. If you have a serious stain, you might be better off taking the shoe to your shoe repair professional. If you have shoes with fabric or suede on the uppers, follow the steps just outlined for suede care. Leather uppers are much easier to clean. Sneaker shampoos with scrubbing applicators remove stains and dirt from the leather surface. If the shoes become scuffed, shoe whitening products restore the original color. Shoe repair professionals can also use a white spray dye to give a very good finish. The big problem with athletic shoes is controlling odor. Because these shoes are constructed with foam and other man-made materials, they are ideal places for bacteria to live and grow. Several deodorizing products are available including insoles, powders and sprays. find a product that absorbs the odor-causing bacteria and counteracts it. A product that simply masks the odor will not solve the problem. Finally, you can keep your athletic shoes looking and feeling new with replacement parts. New laces do wonders for the appearance and new insoles are often better than the originals.